You’ve just joined the fastest growing Drone Community on the planet! Let's Walk Through To Get Started! 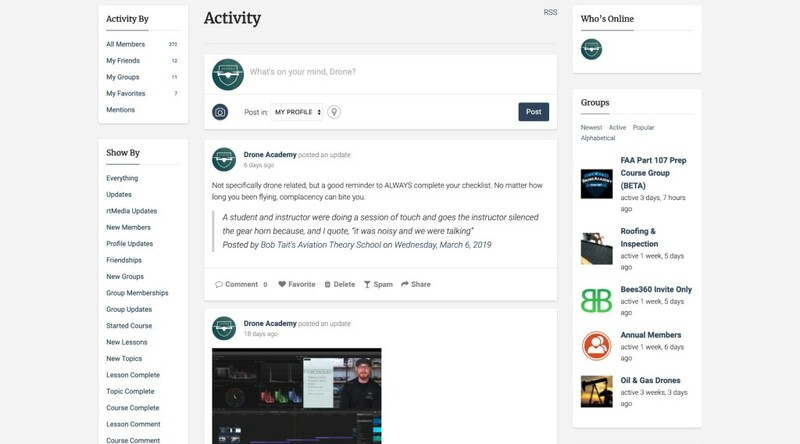 Learning is more fun with friends, that is why we created the Drone Academy Community! Ask a question, share your latest video, or join a study group! Drone Academy has partnered with awesome companies like Lume Cube, Polar Pro, Skywatch, and Epson Moverio to provide amazing deals and promotions! As a Drone Academy Member, you have access to ALL of our training resources including Instructor help! Get ready for the Part 107 Exam, get training for the 107.29 Daylight Operations waiver, or brush up on your video editing skills! Get licensed to fly your drone for money! Learn everything you need to know to pass the FAA's Part 107 Airman Knowledge Exam. This course will help you with the knowledge and skills you need to successfully apply for a 107.29 Daylight Operations Waiver. The best way to prepare for the FAA's Airman Knowledge Exam is to simulate it in our testing environment. Our team is always here to answer any questions you might have about the material or anything drone related! Got questions? Don’t know where to start? We’d love to hear from you! Mash that ‘Contact Us’ Button; our team of our highly trained email readers are standing by!